#N139 Straight legged pants with front pockets and belt loops. Zipper closure. From an original 1970 pattern. #N140 Straight legged pants with rear pockets and belt loops. Zipper closure. From an original 1970 pattern. #N141 Shorts with front pockets, belt loops and sash tie. Zipper closure. 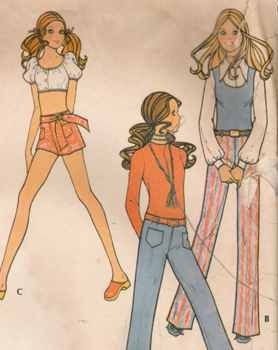 From an original 1970 pattern.